How often do you create art (any art media type)? Either every day or once a month...I'm not consistent. Yeh true though it would be nice to focus on art over other things for a while...having said that I've got loads of paintings I've not got around to uploading. I really need to focus down on certain mediums, but I do really love them all. Unfortunately if I don't I'll probably go down the 'Jack of all trades, master of none' route. 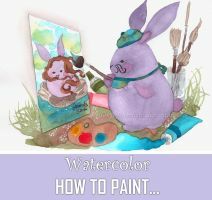 It seems like watercolour really wants you to spend a good bit of time learning it, and learning how to let it do it's own thing. Do love watercolour but it doesn't feel like an easy one to just dip your toes in. Maybe if you focus on just one media you can learn it quicker. After you are more used to it, you can try to learn another one. But in art everything goes...so if you want to make an artwork with pencil and then one with acrylics...do it, why not ^^ Nothing needs to look perfect, it's about the creativity process. 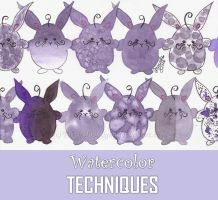 Good to hear, I really need to go through and practice some watercolour techniques. My main problem is not having the knowledge of how to do something before starting a more important painting. True and with a lot of media at least some amount of the knowledge gained can be transfered over to other media, colour, composition, etc......maybe focus on the media that can be transfered and less on things like beadwork? Very true but it can get frustrating if you don't progress, instead jumping from the bottom rung of one ladder to the next. On YouTube there are some channels dedicated to certain art media, like oil painting, pastel, watercolor, drawing. I've been looking up a few and they are good for technique ideas but so far the things I've mostly tripped over are basic knowledge stuff like what stage of dryness to add salt, is masking fluid/paint completely dry before I do something next to it ....all the things you learn with time and practice. just need to get that practice. Wow that is a lot of videos, thanks for making your lists. I was looking for new art videos/channels to start going through, trying to get my procrastination time on youtube to also be useful, so I'll definitely go through them all. This is really helpful, thank you. Daily, because I'm a graphic designer. But for personal projects I don't have much time nor energy. I try to make something during free time at least once a month (it's hard though). Must be pretty hard to "work" in an art/design environment when you don't feel like it...but must deliver something. I need the feeling of wanting to make something, I can't be forced. Haha, I do sometimes think I should be doing something completely different for a living and keep art as a hobby, but I don't know what else to do. It's a bit of a cliché statement but I feel like I can't do anything else. But I just focus on painting at home because work revolves around digital media. It varies, really. Some days I make something, even if it's just a doodle. Other days, I want nothing to do with creating anything. Then there are the days when my muse is on fire and I'm making multiple pieces at once, plus working on writing. Just depends on what the voices in my head feel like doing. Yes, that's most of the time ...it's unpredictable. Sometimes it's hard to even draw a line and other times you don't know where to start because you're so full of ideas. Exactly! Or you really, really want to create something but you sit and look at the page and your mind is just blank. Nothing is coming and nothing wants to flow. I usually get around that problem by creating backgrounds that I can doodle on later. Or just splash paint around and call them ugly. Or I go read instead. How often I create art? I don't create as often as I used to. I think many artists can find themselves in your words. But I try to paint little by little each day or every second one. I make art when I want, I don't have a pattern. I would love to create art more often, but school has to come first. I also get distracted by other things. I prefer to give more time creating a painting than be in rush to finish it .... with no rush comes the " perfection "
I realise that in my last couple artworks . I've been working on a beautiful big size watercolour paint for 3 weeks now and it is going to take at least couple more . So true for me also I hate those long breaks in between my artworks. I draw or paint whenever I have time and I'm in a creative mood. Sketches are more easier and quicker to do so I try to sketch more often, it also helps me to not lose my touch, and when I got some free time I can pick some to actually finish. When I had a working studio, I'd paint three or four pieces per week. Now though, I only paint when I have the time and am in a creative mood. I've been doing a lot of digital and photography at the moment. The average amounts ends up being several a day. Sometimes I can finish a pencil drawing every day, with colored pictures in various mediums every week or so. Sometimes I can't seem to get anything on paper for weeks at a time.